Lovable “Moooo” who lives on a farm by a lake has lots of funny things happen to her and yet she still remains a happy and contented cow! She’s great at moving to the music and has loads of energy and imagination. Children love this cow with personality and the adventures she gets up to – by the final page she is a soggy, smelly, sneezy, ringing, swishy, noisy, dirty, munchy, itchy, black and white cow! Great sing-along song and provides lots of learning opportunities (see “Tips and Ideas”) as well as entertainment. 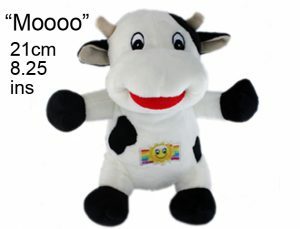 Beautifully illustrated book and soft plush toy cow that match the video are also available. Two choices of the video – with the sing-along lyrics onscreen or the original version. Purchase or watch on YouTube? You can play it ad free and offline anytime with this small cost purchase! 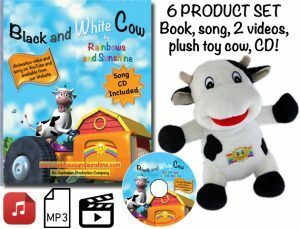 There are many accompanying products to the two animated videos of “Black and White Cow”: a large book with CD and downloadable song included ($24.90); a plush toy cow ($19.90); the song ($1.99), and the complete 6 product set which includes everything! This is a unique combination of matching products for that ultimate sensory visual, audio and tactile sensory experience for children – and they are all bundled together for you at a great price. Click on the “PLAY” button of the image below for a short preview of the book which has the song CD and download included ($24.90)!